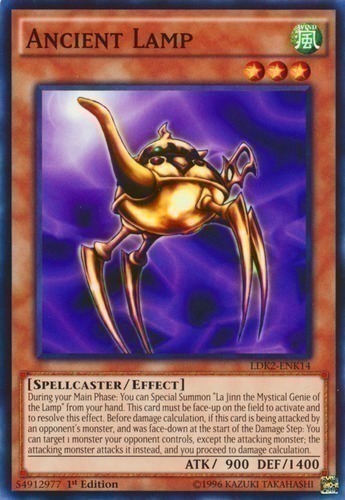 Text During your Main Phase: You can Special Summon "La Jinn the Mystical Genie of the Lamp" from your hand. This card must be face-up on the field to activate and to resolve this effect. Before damage calculation, if this card is being attacked by an opponent's monster, and was face-down at the start of the Damage Step: You can target 1 monster your opponent controls, except the attacking monster; the attacking monster attacks it instead, and you proceed to damage calculation.